Watch better quality video here! Thanks CBS 60 minutes for exposing this! 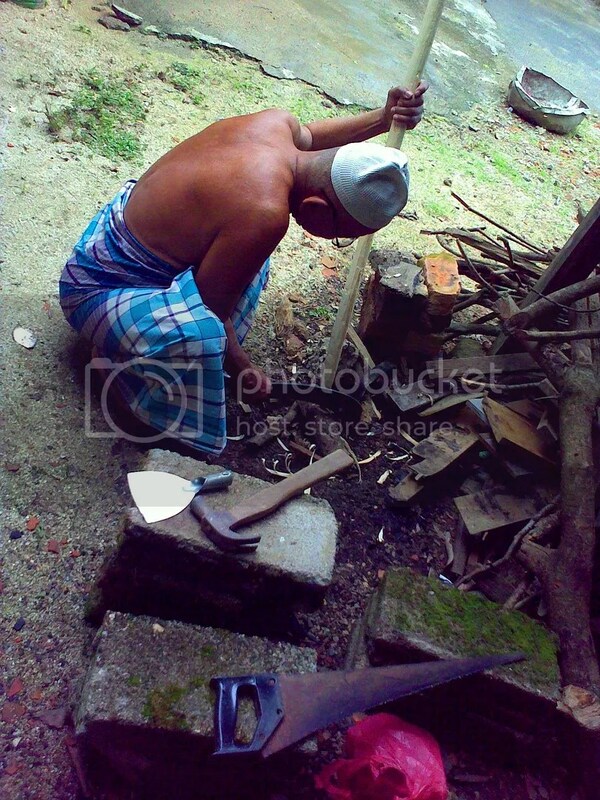 Today we are going to have our own version ‘bubur asura’. But the day before, this man has already make a few arrangement for today’s event. He prepared the scoop to mix the porridge. He told me that he has already got one. But he need to prepare another one in case they make two cauldron of the porridge today. His age is already more than 80 years old. He does not have the proper birth certificate which can indicate his true age. However, by comparing his age to other villagers, which has the certificate and some has already got another certificate, he seem to be quite an old citizen. When he went to help cutting a cow in the neighborhood earlier in the morning, he was told that a good friend of him had passed away just the day before. If he knows it earlier, he would ask someone to send him to the funeral as he couldn’t go to a long trip as far to the Beris Lalang anymore. He doesn’t have the young age stamina anymore. According to him, including the person all of his 9 best friends had already passed away. He is the only person who is still alive among them. These 10 person are the one who responsible opening the Beris Lalang, which once was just a jungle full with wild animals. Now, the place is developed with buildings and agricultural growth. But this old generation is already forgotten by the new ones. Hopefully, he will stay strong today and the days to come. Able to taste the porridge that we make today and all Muharrams to come, Insyaallah. Salam. It has been a while since I last wrote something in this blog. There’s a lot going on here but being Naziha, she tends to keep everything to herself. (Read: Naziha perlu belajar untuk berkongsi cerita). and and sy sedar ramai rupanya baca blog ni. “Eh jiha, comel la ade blog family.” “Err alamak cane tau?” “Alaa tiba2 terjumpa” “Alamak *gelabah*” kawan2 saya yg sy definitely tak penah promote(except for some), kawan abg2 saya, family sy and I hope it stops right there. err ok maybe my brothers would love to make it famous. ok surrender. Muktamar 2008, Houston, Texas. Ramai. Ramai org2 yg baru fly. Tahun ni saya jadik ajk madrasah(Read: perkhidmatan kelas2 menjaga kanak2 ketika mak ayah diorg pegi talk). So most of the day, I helped mbak2 with the kids. waah macam2 gaya wa ckp lu. Looking at them, sy terfikir jauhnya masa da berubah. Diorang sorang2 ada psp, nintendo and handset mengalahkan YB. Kita kalau dulu, umur dlm smbilan spuluh thun still main pasir kat blakang rumah (ni permainan terlarang). Very outspoken dgn english yg berkebok2. semua da gaya americans yg very outspoken. Penat den nak kena layan. alaa miss2. Ok then post muktamar. kelam kabut. pegi Islamic Da’wah Center, NASA, etc. pengajaran muktamar: banyak. and the most noted thing is that ahli MISG mmg kena belajar to sacrifice. I still remember reading kak ena’s report about muktamar and she said the same thing. now I think that is so true. 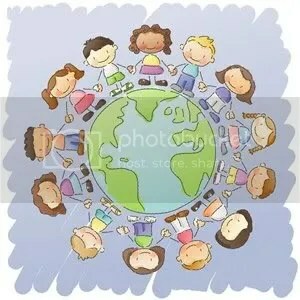 even if you only can attend two lecture for the whole muktamar, it is ok. Putting others in the first place is not easy but of course it can be done. Precious Provisions- Fiqh of Food and Clothing. AlMaghrib, Memphis. Coming back from muktamar on thursday if I’m not mistaken, the next day, we went to memphis. ni masanya sy membalas dendam. hehe. Kelas al maghrib kali ni mmg sy nantikan since mula2 tau lagi. Banyak belajar of course, plus, it is my fav sheykh teaching, Sheykh Yasir Qadhi. Weekend penuh terisi, Alhamdulillah. and abah, you are right. Maaf tak dgr ckp dulu! Nanti kalau ade masa maybe i can share the notes from that class. Dum dum dum. New sem started. (read: da nak grad). Betol ckp dols, byk bnda nak kena start pikir. Since my life usually full of choices, that most of the time I choose “not-so-right” thing to do, ugh now I dont know. I know nothing. Thinking about tomorrow is so complicated since there’s nothing certain. Fuh. Kelas susah. susah. susah. seriously i never thought that antibody can be so complex. and statistic can be troublesome. signal started to be “err..” because Prof Weiss loves to ask questions. Read ahead girl! 214? suka sbb cikgunya sgt cool. kelas engineering tp cg bawak guitar and main guitar. how guitar related to fundamental stuff in electrical engineering. menarik! Oh kawan makmal saya awesome. yay to me for that. a big YAY! Ohio State University. Tamrin Spring 09. Tamrin, Ohio. Fuh seronok. jumpa kawan2 lagi. blajar lagi. and ohio snow ok. belambak2. Perkara yg sy plg igt ialah syahwah and syubhah. ok kawan2 baca betul2. dlm hati kite ni ade dua penyakit. 1. syahwah. ni bile kite rasa kite bagus, riak, etc. “woh power gak aku bley ckp camnih kat boss”, “wow diorg ni tak igt sirah ke. nabi lahir kat mane pon tak tau.”, “woh rs cam awesome lah plak sbb bley jwb soalan prof tadik, mat saleh sume tatau. aku je tau. wow wow.” haha beware ppl! walaupon bnda ni terlintas sket je, tp heh pahala boley lesapp cam tu jee. Nauzubillah. 2.syubhah. strike bile kita rasa was2, tak sure, etc. “Eh aku ni betol ke? telinga dulu ke muka dulu”, “aiyak rasa mcm sure tp kang bile ckp, salah malu plak”, “eh eh eh da angkat takbir lom ni”. Piaa not gooodd… I think bnda2 camni la jadik punca bile kawan2 boley gaduh, anak2 buah tak puas hati ngn ketua, family bercerai berai. Bila rasa tak selesa ngn org, it would be such a wonderful thing to do if we can take a step back and think, heh macam la aku bagus sgt nak tak puas hati ngn org and maybe there’s something wrong in me that ppl treat me this way. Pointing finger to ppl wont solve any prob. Ok maaf da membebel. Ok tu je lah kawan2. bnda2 yg saya boley share. Yg lain2 lain kali. Newly appointed Gossip Girl for the Lazim's. xoxo. 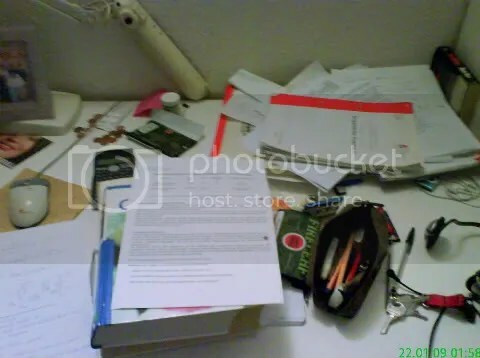 Tengoklah meja belajar saya. Mungkin sebab tu kot belajar tak pernah habis. Meja tak pernah kemas. Kalau dekat Malaysia ni mesti dah kena sound ko abah. “Nak bui ular bersarang ko?”. Pastu Ma tolong kemaskan. hahahahah. Apa point entry ni saya pon tahu lah. The mini handball games that took place in IPBA this week..
C3 Lakers (?) Standing from the left, Alvin, Justin, Onn, John, Azizi and I. 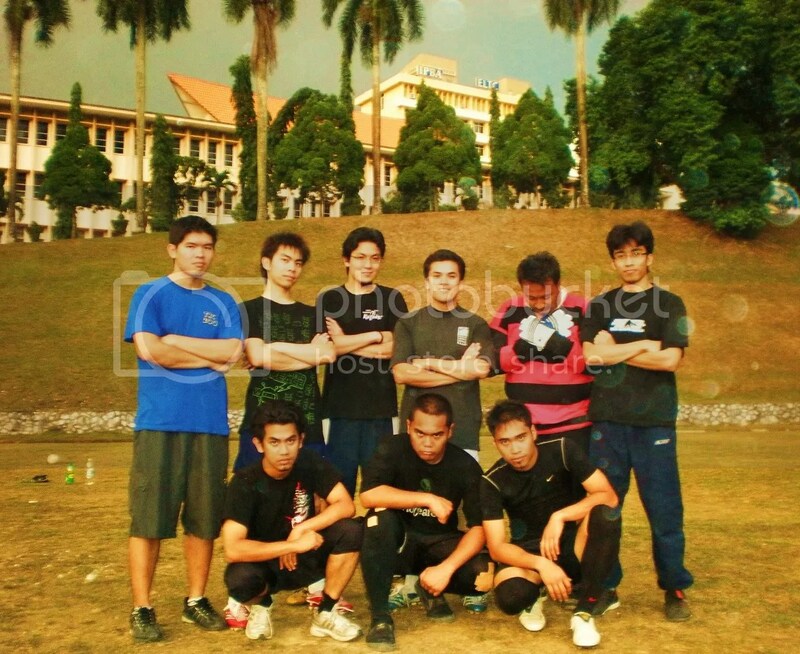 Sitting, Adha, Usher, Apek.. Ayie was not in the picture..
At the group stage.. everyone got a kick out of the game.. The hot semifinal.. it was raining though.. In the final game.. and we won.. yataa (I was just the poor sub).. 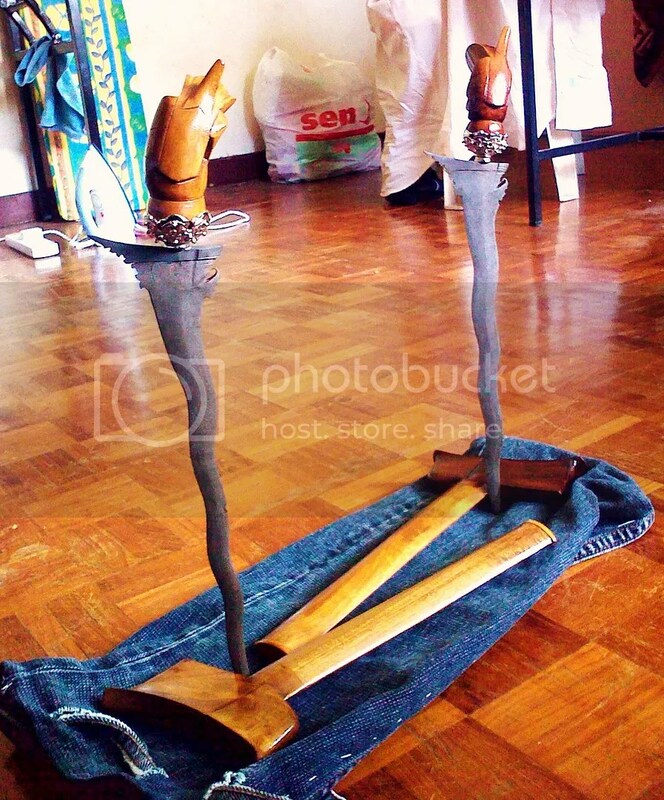 This is a pair of ‘keris gelanggang’ that I have. I bought one before I fly overseas and the other after I came back. These kerises will hopefully be my toys as well as my pets because I do not have anything to take at the time being. I am still learning and there are still looots of thing that I don’t know about this area. By having my own pair of keris, hopefully I will be able to learn better. Before this, I need to borrow my Tok Gurus’ keris if I want to learn the movements and all. I believe that the borrowing part need to be minimise because not like before, I can afford to have my own stuff now. Alhamdulillah..
Kesan Boikot Produkt Israel dan Sekutu. Tahukah kita bahawa perniagaan yang menjual barangan Israel dan sekutunya ini banyak beroperasi di negara-negara muslim, memberi pekerjaan dan meningkatkan ekonomi sesebuah negara. Tidak terfikirkah kita bahawa usaha boikot tersebut akan merugikan diri dan negara kita itu sendiri? Lihat kepada salah satu syarikat yang mengalami kesan teruk akibat boikot – McDonald’s. McDonald’s merupakan “rakan korporat utama” kepada Jewish United Fund (JUF.) JUF menggelarkan diri mereka sebagai “bekerja untuk mengukuh ketenteraan Amerika, sokongan ekonomi dan diplomatik kepada Israel; memerhati dan sekiranya perlu, memberi respon kepada laporan media berkenaan Israel.” Pengerusi dan Ketua Eksekutif McDonald’s adalah Jack M Greeberg, yang juga merupakan Pengarah Kehormat American-Israel Chamber of Commerce and Industry. Beberapa syarikat yang sedih dengan apa yang dilakukan oleh rejim Israel terhadap Palestin, membuat keputusan untuk turut bersama memboikot Israel. Pada bulan May 2002, Texas Automotive Export, iaitu sebuah syarikat di US yang mengekspot peralatan kereta telah memutuskan untuk tidak meneruskan perniagaan dengan Israel. 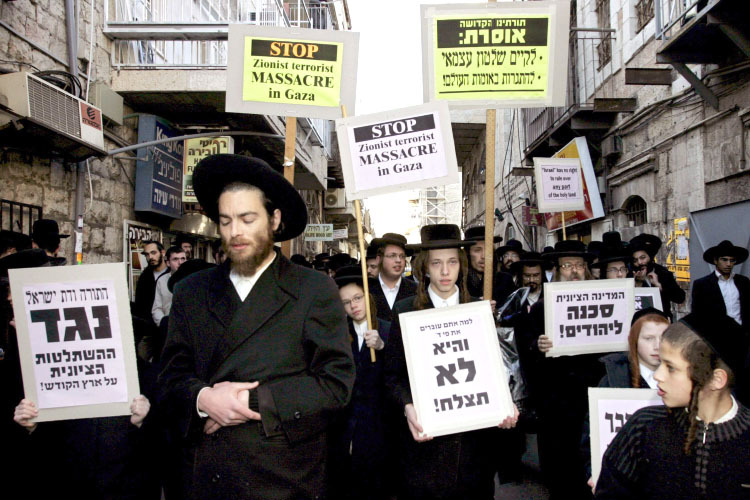 Orthodox Jew against Zionist Massacre. Do Israel have their oil resources? Do they buy the oil from another country to fulfill their daily oil consumption? Which countries did sell their oil to Israel? Does USA supply the crude oil to the Zionist? Do the Arabs countries do supply the black gold to them? How can USA supply the oil because they are second biggest oil importer? Did USA import oil from other country and then export it to Israel? Which country did export their oil to USA? At the end of the day, it is all about money. Forget about Judaism, Islam and humanity. Of all things, money is the only thing that people really give a damn. Money is people’s God. They don’t really care about their own brothers. It is “ok” for the Zionist to kill Muslim because it is the Zionist nature. But it is not acceptable for the Muslim to kill their own blood, which is Muslim. Hadis Rasulullah S.A.W Riwayat ??? 1. 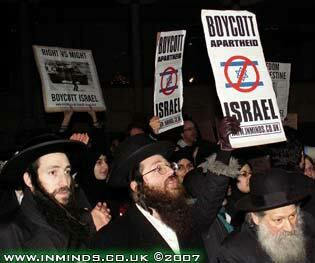 An orthodox jewish against Israel. 2. An orthodox jewish Rabbi against Israel. KL, 3rd January- The rear seat belt campaign that was launced in Abe Hapih’s car was close to success but the first Hail spoil it because of an unintended reason. At first this boy only said ‘tat… (it is tight)’. 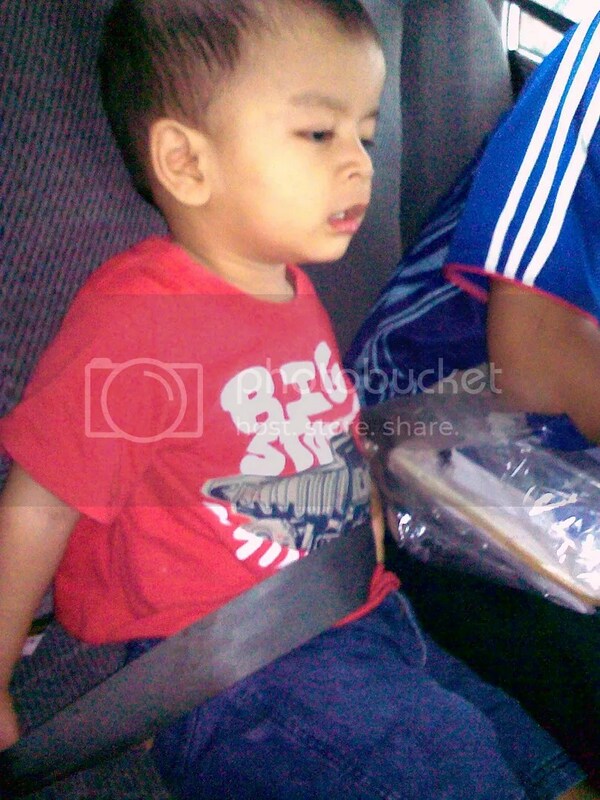 He tried to move his body away from the seat belt, but he failed to so.. His Ayah su and uncle manage to make the seat belt tighter (but not too tight) to prevent him getting away. After a while, he cried as his attempt failed. Nobody cared though. He tried to squeeze his body up and down but failed as well. The boy cried harder. According to his mother, he will vomit if he cries loud in a long period of time. 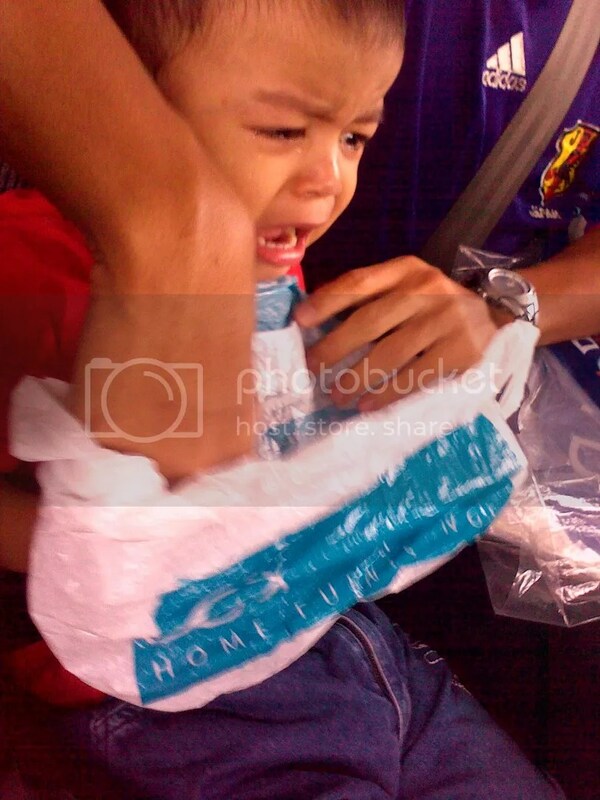 The boy nearly vomit, thus the plastic bag was the first aid in the moving car. Because of mercy, we take the seat belt away from him. 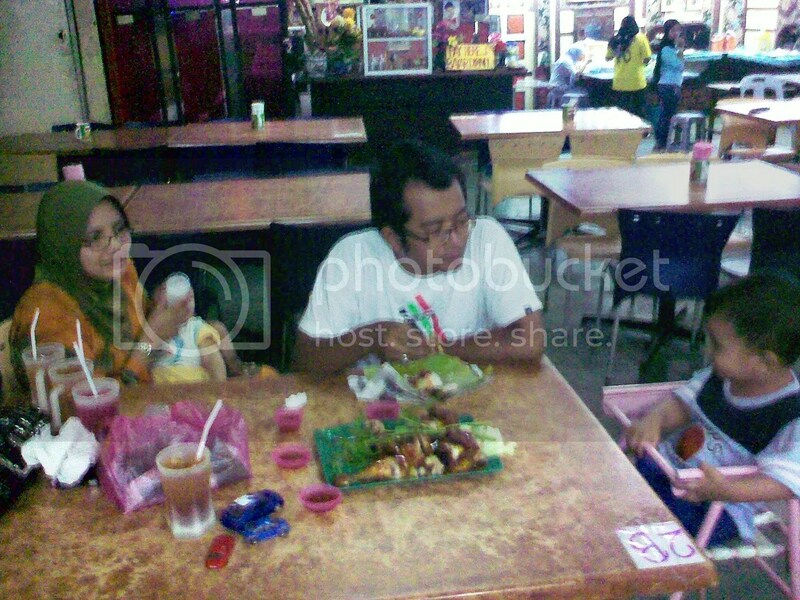 huhuhu.. free he went, no more tears or puke.. Maybe his Ayah Su can try to tie him again if he come down to KL. In one of the talk that we had in the orientation week in IPBA, I had come across one fascinating fact that made me feel energetic but at the same time feel guilty. In the talk, a lecturer share the experience that he had when he studied oversea. To make it short, he went to Palestine and saw how the Israel children were raised and educated. Every morning before the class starts, the children would gather and one of the activities in the assembly was to read their oath. Some of the content of the oath were ‘the tastiest drinks is the blood of Muslims, the tastiest food is the meat of the Arabs, and their belonging is between the river of Nile and Fura’ (basically all of the Arabs’ land)’. That is how the Israelis brainwash their citizens. Create the never exist myth into a reality. We teach our children all the artists’ name since they were small but do we teach them at least the 99 names of Allah? We know the gossips about people around us. We are too busy talking about others but we lost track about who we really are. Polytheism happens everywhere although we claim that we are the believer of the Muhammad’s faith. We blame everyone for what happen in our daily life, especially for what happens in Gaza. But what have we done? Pointing finger at others will only result other four fingers pointing back to us. I feel energetic because I will be one of the heroes educators who can touch the future, but at the same time feel guilty because am I the right person, taking the responsible? Huhuhu. Thats all for now. Actually I want to put just the quotation but my fingers won’t stop typing things. huhuhu.. Is there any link between the quote and the bark? as well as the song? Hmmm.. When I contacted my mother this evening, I’ve got one sad news. 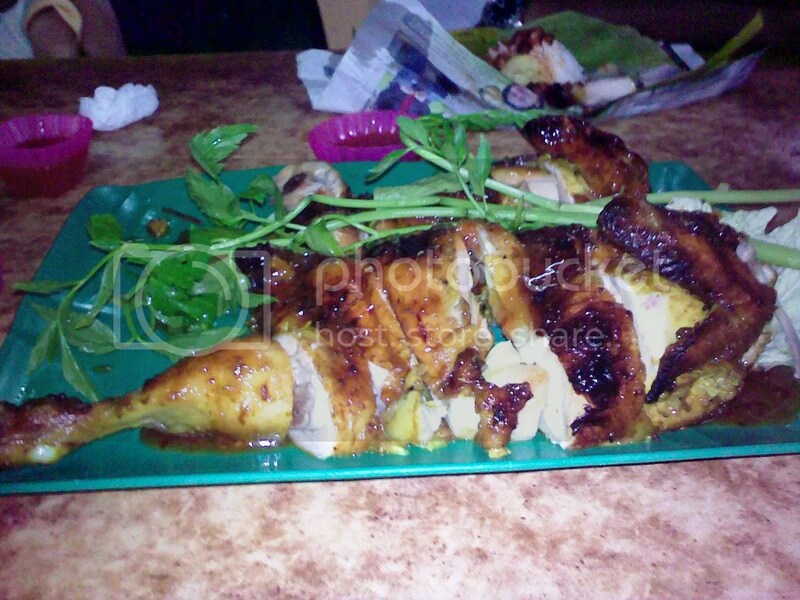 Abe Je’s Vespa ‘Ayam Bapak’ was stolen probably early in the morning today. 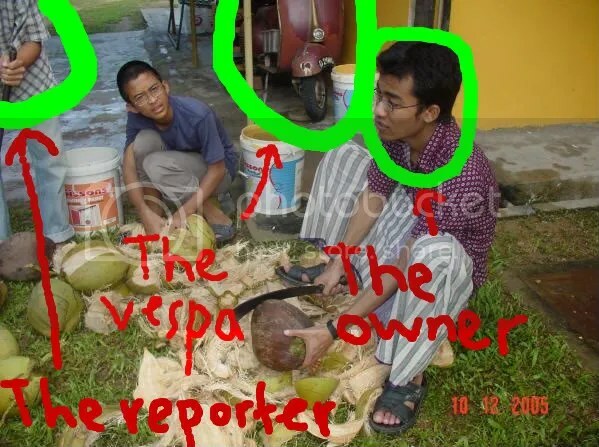 The Vespa had been staying in the garage at home for years, nobody bothered about it since it is not functioning anymore, but today, its gone. There are reasons for everything that happened and hopefully we can accept the lost. We can plan, but God is the greatest planner. As for Arif, he has just gone for his regular medical check out. He has got one injection on his tight. His body temperature kept on changing from time to time, perhaps trying to adapt the medicine that was injected. Because of his special decease, he need to be checked carefully by doctors and nurses in every meeting, which would take approximately at least two hours. Besides, he has got sore on his skin maybe affected by some fungus (?). Luckily Arif is a tough boy, still able to smile and laugh although only God knows what he has faced and will be facing in the future. Maybe I will talk a little bit about his decease in the future. To Kak Atie, happy birtday!! Tresure the diamonds that you have. May God bless you and the whole family.. Amin.. This may the least thing we can do. BOYCOTT ISRAEL!!! May Allah bless you. 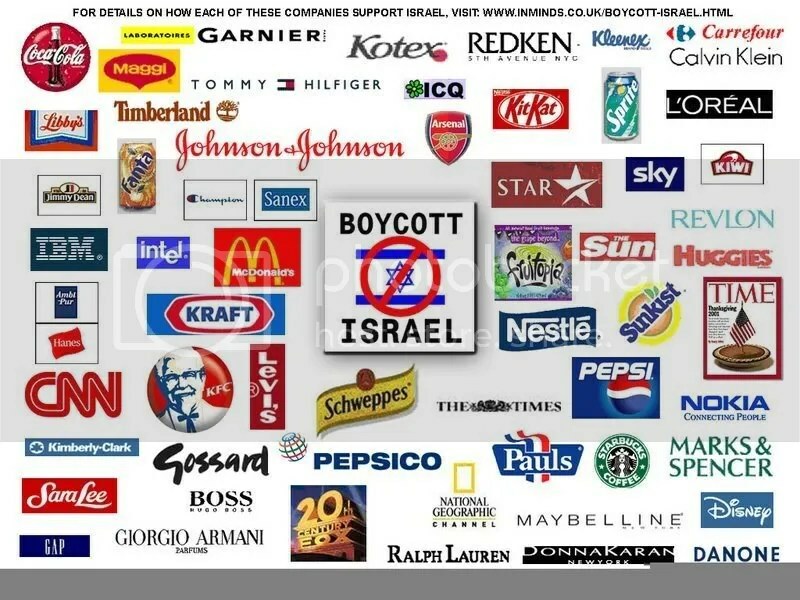 For details on how each of these companies support Israel. “Dan telah Kami tetapkan terhadap Bani Israil dalam Kitab itu: “Sesungguhnya kamu akan membuat kerusakan di muka bumi ini dua kali dan pasti kamu akan menyombongkan diri dengan kesombongan yang besar.” Al Israa’ ayat 4.